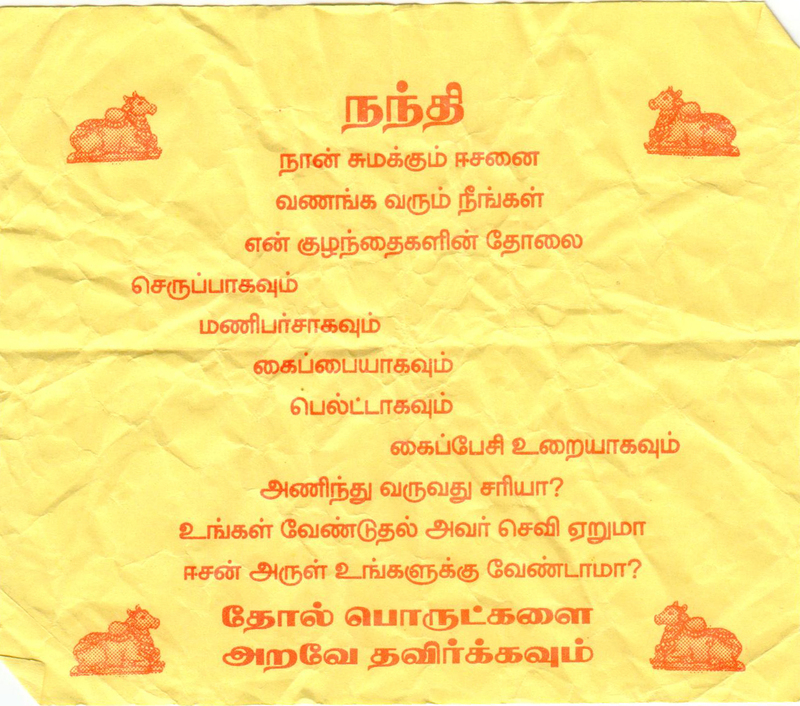 Distributed in one of the temples during my last trip. I had been planning to post this but today is the day for that it seems! How mad/illiterate I’ve been so far???!!! I never knew till now that leather is made of animal skins. Soon after I saw this post, I’ve been searching for vegan shoes/wallets etc. Also visited websites such as PETA etc. where it has been explained how animals have been cruelly killed to tear the skin!! It was completely shocking for me that all these days I’ve been using these products!! Thanks Mahesh for the post and creating the awareness. It is not that we condemn only cows. We all believe in ahimsa – meaning no himsa to all – not just animals – even to humans – manacha, vaacha etc…Of all animals, cow is considered as mother. That shouldnt be interpreted as we are ok with killing chickens etc…. அப்படியானால் தானாக இறந்த, யாரும் இம்சிக்காத பசுவின் தோலால் செய்த செருப்பு, பெல்ட்டு, மற்றும் பர்சு அஹிம்சா முறையில் தயார் செய்தது வைத்துக்கொள்ளலாமா? Our Sastras say Gho Matha is God with all 33 crore devathas residing in her. That is what our Periyava re-iterates in Deivathin Kural. Killing her is a greater sin than killing a fellow human being. Just like we regard some species as special Mother Cow is the greatest of all according to Sastras. Even from a practical view point there is no species that gives us more benefit than Mother Cow both spiritually and in our day to day lives. Vibuthi, Pancha Kavyam, Go meyam, Go Mayam etc. for Yajnas; Milk, Curd, Butter, Buttermilk, Ghee, Cheese etc for our practical lives as well as being used in Puja’s. Go Meeyam, Go Mayam (Cow dung and urine) are used as medicines to cure various diseases including cancer. Gobar gas is prepared from them as well. So even if you look at it from a Thanksgiving perspective it makes more sense to protect Mother Cow as a species if people don’t believe much on the spiritual side. In my research and talking to experienced persons dealing with cows I find that our Naatu Maadu (Native Indian Breeds) are very special and needs to be protected BIG time as they are getting extinct fast as people find their flesh much more tastier than other foreign breeds. I will post a summarized version of Scientific and Spiritual benefits of Mother cow shortly. Hope this helps. Ram Ram. How do you justify animal sacrifice in Yagnas? Same Ahimsa scale is not applicable? The animal sacrificed is called “Yagna Pasu” and it has Vedic approval. Mostly it be goats and Roosters! Sorry to be Devil’s advocate! @ana, from your very first question, l knew you are devils advocate. Normally I dont respond to humbugs who ask these half baked questions, but in your case I am making an exception. Yagya Pashu need not be real one. Shaastras give exceptions for every thing. Hinduism scriptures often have personification of divine. The west misunderstood and spread false lies without fully understanding the dharma of hinduism. What is mentioned as pashu bandhanam is actually tying of our animal instincts. Just the way tantra says the divine can be made to manifest in stone through vedic mantras, just the same way, the yagya pashu is made of dough and the spirit of the animal is summoned in it using mantras. There are vedic mantras which ask for the devas to accept the yagya pashu made of dough instead of live one. We see this in Soma yagya. The actual soma is extinct, so, some other herb is used and the yagya rithvik asks for devas to accept this instead through the vedic mantras. Same way in pitru puja we use masha for the sacrifice to our manes. Grama devathas are different. They are non vedic and local deities whose appeasement modes are different. Revered Ana, I agree with you. My mother had witnessed Somayagam done by Sri Anantharama Diskhitar and she has told me about how the yajaman consumed a minute quantity of vappai as you say and she has told me how it looked like muslin. After reading Periyavaa’s discourses, I have gotten some clarity on the subject. So I would not dismiss your questions as humbug since the Paramacharya has endeavored to clarify those questions for us. Here is Mahaperiyavaa’s discourse on Animal sacrifices. I have seen real goat / rooster sacrifice done in Somayagam and vapaahuthi consumed by Yajaman. As a school boy, I have witnessed in Kumbakonam surroundings. Not that I am against it. Only wanted to highlight the “Ahimsa scale” is not extended to Yagna pasu. People who argue Ahimsa need to be aware that trees are also living beings and cutting a tree is also killing a life. Paper is manufactured from cut trees and even “Nandi” ahimsa distribution is done in printed paper. In India, we all use mosquito mats and kill mosquitoes daily at homes. Is that not Ahimsa? We can find shoes made of synthetic material at Payless Shoe source for a simple version and online at many vegan shoes outlets for more upmarket versions. Also, I read some time back, an incident, where Mahaperiyava, while on the Satara Yatra, brought out the fact that cows abroad were fed slaughter house leftovers (when the Greek aristocracy sent milk powder to Mahaperiyava for use of Veda Patashala students). 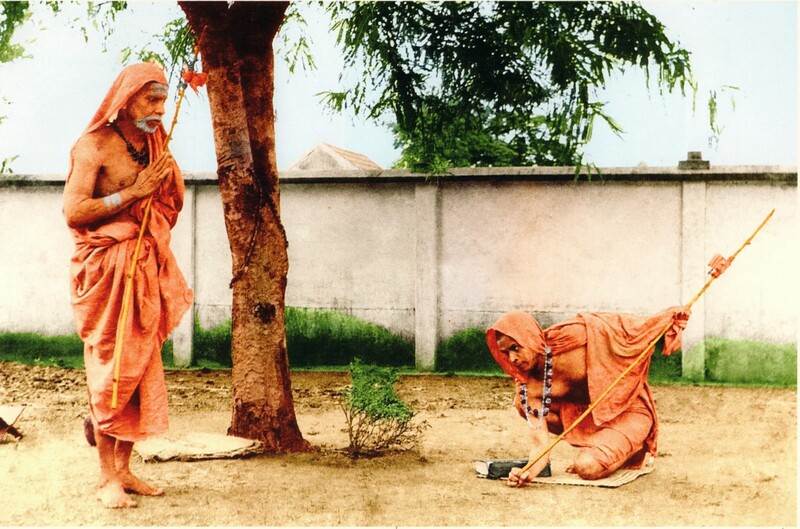 Mahaperiyava had that milk powder distributed to non-veg’ns. On researching, found out that this is true for all milk, EVEN organic. This feed is called animal meal( ‘meal’ means ground food) or fish meal, based on its contents. The nerves and brain were banned from being used in the 80s when there was mad cow disease. I stopped having all milk products, but it was very very difficult, especially buttermilk. On researching grass fed raw milk which was very expensive for us, the store owner enquired about my needs and after a quick call, told me that cows of Straus creamery in California (where we live) are completely vegetarian. I’ve been buying Straus whole milk since then. It is also non-homogenised with cream on top. So for ghee, I use this cream and make it at home, or buy Amul ghee made in India. Amul also makes ghee in the East Coast, do not know about the feed for cows there. Once, when I contacted another organic milk company with cheaper milk, to find out whether their cows were fed animal of fish meal, she replied “We GENERALLY feed plant based products to our cows”, but did not say outright that they do not feed it any animal of fish meal. So I did not pursue this research further and satisfied myself with what Mahaperiyava has so compassionately given me. Your statement is true, Ana. But what you really need to know is the deer skin or tiger skin used by His Holiness is not gotten out of “Himsa”. They were acquired by someone after the animal dies naturally, and later presented to His Holiness. Hence, they are to be considered to be “Ahimsa”. As per the Sastras, there are different AsanAs (seats) fit for meditation. Dharba grass, wool, deer skin and tiger skin produce certain positive vibrations for the person who is meditating. It is important that the skins are acquired after the natural death of the animals too. The same sentiment has been expressed on the use of silk as well. You would have heard of building Hanuman temples when monkeys die. I know of an incident (first hand from who witnessed the conversation with His Holiness) about someone inviting Pujya Sri. Maha periyava to come to a Hanuman temple they built in some village. His Holiness politely refused. But the devotees were insisting that the temple was on his yAtrA route, and He can stop by for a few minutes. His Holiness said that the reason for His not going to the temple was because the monkey did not have a natural deat, and it was killed by someone. Later a temple was built using that monkey. As far as Lord Shiva wearing these skins, there are different purAnic stories that are associated with each of them. The significance comes from there. I totally understand this and try to avoid leather as much as we can. In this context, I have become a vegan avoiding dairy products. We use a particular brand of organic milk for abhishekam.I use that brand for drinking tea too. Outside the house, I do not use milk at all anywhere. We can use Soy milk and Almond milk and so on for all the requirements. This particular milk says that it is a happy cow milk from a local PA farm, where cows are raised outside in pastures. However, we have to wear leather based products sometimes, like formal shoes to work. We can live without leather for most part in purse/wallets, belt, leather cushions and so on. I have been thinking about this a lot and to promote this concept, we need to bring awareness very well from 2 aspects (religious and non-religious). We know the religious aspect very well. 1) Milk produced in the western world is primarily for business to make money. Hence, to increase the yield, cows are given hormones.Cows are not treated well. They are put in the barn with little place to move. They do not get out to enjoy pastures. They are treated like machines. Organic milk does not mean that the cows is treated well. 2) Milk is de-homogenized and then re-homogenized as part of the processing. This is the reason many people are lactose intolerant. In India, we take the milk from the cow/buffalo and then boil and drink it. The milk does not go through this processing for preservation, which is good for the stomach, even though has less shelf life. 3) All cheese is non-vegetarian unless specifically the manufacturer writes “rennet-free” cheese. Rennet is produced in the gut of calf. Since the veal production is substantial, rennet from the gut of the calf is used to make cheese. 4) You all know whether leather comes from. With so much of cows and calves going for slaughtering, there is no dearth for leather. Hence, I chose to be a vegan. Sometimes, people have treated me as if this is a cult. That is really hurting when people talk like that. However, I choose to use a particular organic milk is organic, where cows are pasture raised, and the claim is where the cows are treated like their own children. We should educate each other of such products which we can sue so that we do not harm animals and especially cows. We have a large Hindu population and this could be a separate market for the manufacturers. Ravi – I agree with you. Shoe is one thing I am struggling to find a solution (only for formal wear)….The other two things I need to get rid off – (1) my van has leather seats (2) my couch that is leather….Hopefully soon, I will get rid of these two as well…. It is very easy to stay clear of leather products in this day and age. There are polyurethane or cloth replacements for everything, such as purses, belts etc. Yes, true. This appeal should be listened to. In India, in some Khaadi Bhandars, I understood that they sell ‘Ahinsa leather products’ meaning that these are made from the skin of animals that meet with natural death and not from animals that are killed for meat. Nice Sri Ramaswamy, still you can avoid leather products and if you want, you can go synthetic leather products. May be you agree with me!